Despite an initial Broadway run that was, to say the least, severely abridged, few theatrical works have as culturally schismatic a performance history as composer, lyricist, and librettist Marc Blitzstein’s 1937 play in music The Cradle Will Rock. Made much more well-known twenty years ago by Tim Robbins’s film of the same name, Blitzstein’s operatic effort was originally a production of the Federal Theatre Project, a New Deal program whose primary goal was putting artists back to work during the Great Depression. But Blitzstein and his troublemaking director, a 21-year-old Orson Welles, had much larger ambitions. With its pugnaciously pro-labor-union message, The Cradle Will Rock drew the ire of Congressional conservatives who financially pressured federal administrators to shut down the production, though Blitzstein and Welles, in a coup de théâtre for the ages, managed to mount a performance at a nearby, privately-owned venue, with Blitzstein performing the entire score himself on a piano. In an ironic twist, the actors had to give their lines from the audience to avoid running afoul of union rules that prevented them from appearing in the show without the permission of its original producer, the U.S. Government. While it’s a great story of art fighting against censorship, that doesn’t necessarily mean the art itself was great. 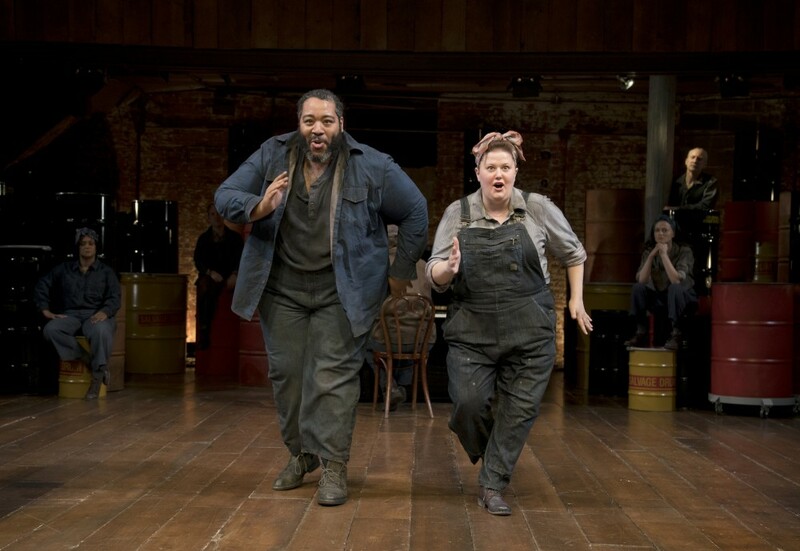 In making a case for the latter, the Classic Stage Company has stacked the deck impressively, restaging Blitzstein’s mostly sung-through work with a cast that could have given Welles’s legendary Mercury troupe a run for its money. Led by director John Doyle, who brilliantly helmed Bertolt Brecht’s fascist parable play The Resistible Rise of Arturo Ui earlier in the season, the ten actors, each of whom portray multiple roles, give affecting allegorical life to Blitzstein’s Steeltown, USA. It’s a rotten place, where everyone exists under the thumb of the local industrial oligarch Mr. Mister (David Garrison), though, some of the town’s more prominent citizens squirm their way onto his so-called Liberty Committee, where craven subservience has its rewards. Or, at least it did. 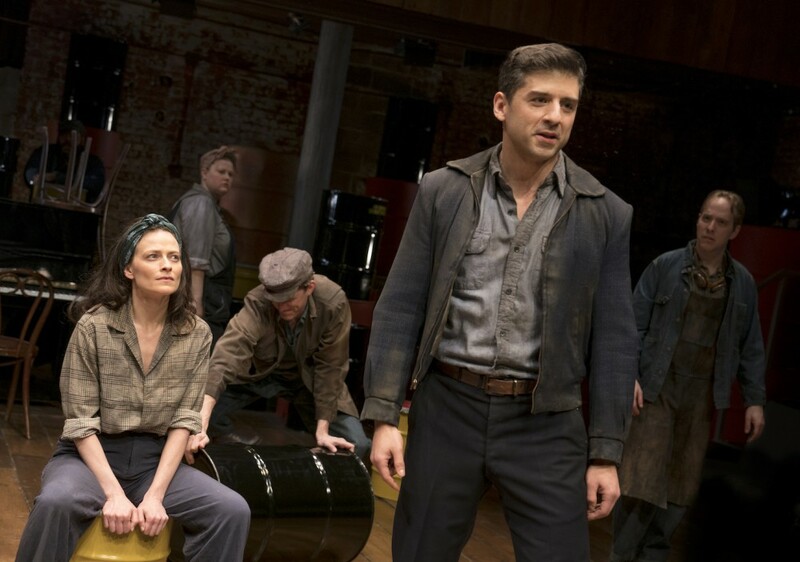 Near the beginning of Blitzstein’s story, the swells of Steeltown find themselves behind bars after their wealthy benefactor indiscriminately orders the streets cleared of all rabble on the night of a union drive. Now, they wait for Mr. Mister to show up and tell them if their devil’s bargain still holds true. Tossed in the clink with Steeltown’s fretful haute monde is Moll (Lara Pulver), a prostitute whose integrity far exceeds that of her cellmates, since what she’s selling is out of desperation, not greed. As the night wears on, Moll, and the audience, learn how things really work in Steeltown, where Mr. Mister’s bought-and-paid-for lackies include a newspaper editor with fungible journalistic ethics (Ken Barnett); a preacher with a fungible soul (Benjamin Eakeley); a doctor willing to lie about the suspicious death of one of Mr. Mister’s employees (Eddie Cooper); a university president with a sliding-scale commitment to knowledge (Barnett); and even—horror of horrors—members of the arts community (Ian Lowe and Rema Webb). Essentially, Blitzstein is putting all of these fine upstanding people on trial with the audience as the jury, though the uncomfortable and not-too-subtle implication hanging in the air is that some members of that jury might be equally deserving of judgment. Blitzstein’s bite also extends to his wit, chomping down on Mr. Mister’s wife (Sally Ann Triplett), who acts on her husband’s behalf with all the charm of a cutthroat consigliere, Mr. Mister’s spoiled, dunderheaded children (Cooper and Kara Mikula), and a troika of hapless professors (Lowe, Mikula, and Triplett), only one of whom has the courage of his incomprehensible convictions. In addition to Blitzstein’s ingeniously multifaceted score that sounds like Beethoven-meets Weill-meets-vaudeville, what largely fuels The Cradle Will Rock is anger, targeted less at the Mr. Misters of the world than at the “scared bunch of ninnies” who make him possible. Shouting at them (and us) on Blitzstein’s behalf is Larry Foreman (Tony Yazbeck), a union organizer with complete faith that the future is on the side of the have-nots. And, as the evening concludes, he’s ready to lead the entire audience out of the theater to hurry it along. But I didn’t see anyone rising up from their seats. Of course, from our current temporal vantage point, we know what happens to Larry Foreman and those who followed him, both their successes and their failures. 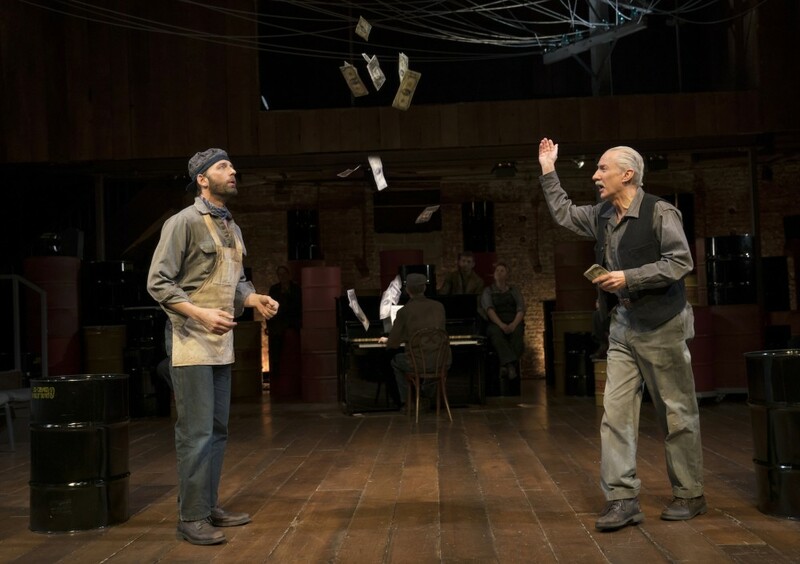 No doubt Blitzstein hoped that succeeding generations would regard The Cradle Will Rock as a period piece about the bad old times when workers fought for their fair share against a violently corrupt system. But, sadly, to a contemporary audience, the most unfamiliar aspect of Larry Foreman’s struggle is the struggle. Unlike with Arturo Ui, in which Doyle found a clever way to bring Brecht into the present, he’s left Blitzstein squarely in the past, speaking a radical language that doesn’t seem to connect anymore. That could be why the dominating feature of Doyle’s set is an old wooden telephone pole with a web of lines going nowhere.